Four Square In The Air is a fun drill during which players get to test their juggling skills. The idea of the game is to develop skills working with balls in the air so that in a fast moving game the need to bring an air ball to a player’s feet before distributing it is eliminated. This is also a good example of a consequence rule for younger players – when a point is lost you must sit out and so the better you play the more you play. 1. The field is divided into 4 equal grids numbered 1 to 4. The grids are about 8 yards long by 8 yards wide. One player occupies each grid. The object of the game is to stay in the champion’s grid, number 4, as long as possible. 2. To start a round, a player serves the ball (as in a throw-in) from the back of their grid into another player’s grid. The serve can be played from the air or allowed to bounce on the ground once or twice and then juggled. It must be played in the air and land in any other player’s grid. 3. 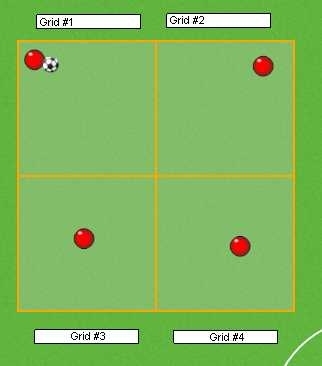 Each player is allowed a certain number of bounces and touches before returning the ball to someone else’s grid. 4. If a serve lands in grid 2, for example, and then quickly bounces into grid 3 before the player in grid 2 actually touches it, then player 2 is out. 5. A round can end when the ball lands outside of the grid boxes or a player allows more than the limit of bounces or touches. 6. If a ball lands on an interior line, it belongs to the player in the higher-numbered grid and is their responsibility. 7. At the end of a round, the player who lost the point leaves the game and must wait to get back in. The remaining players move up a grid to vacate the spot and a new player is brought in. The player that knocked out the departing player serves next. – make throw-ins that their teammates can handle. – learn to softly trap a ball out of the air or on a bounce. 2. Using a chest-to-foot trap in the air. Tip #1 – Offer rewards for making or staying in the champion’s position. to allow an air ball to land at a player’s feet before passing or shooting it. and let them play the ball in a way that works best for them.